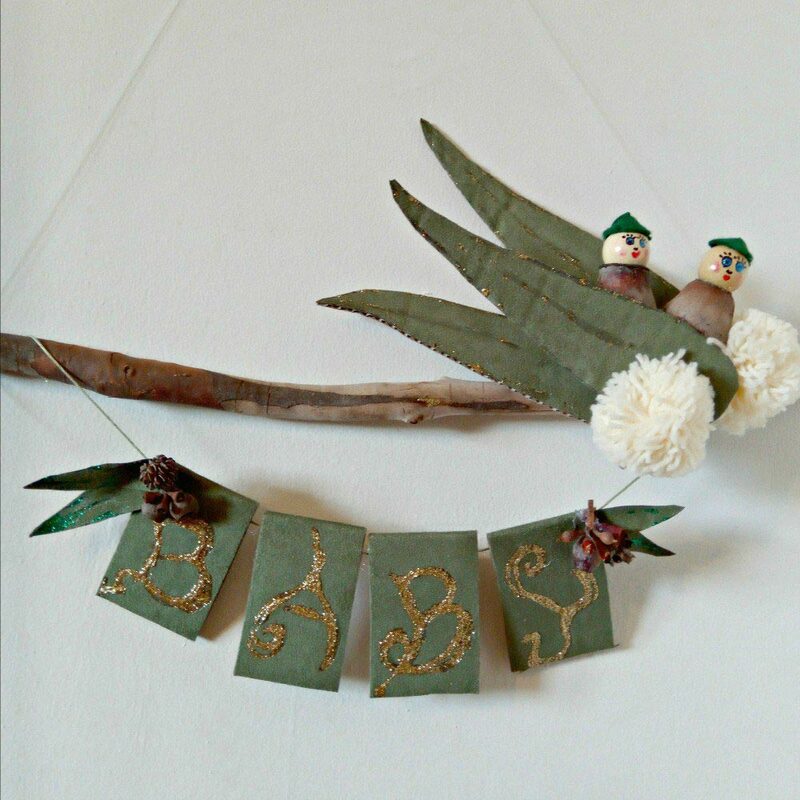 Homemade gifts made with love, here we made a little nursery wall hanging for a baby gift inspired by our favourite Australian Bush Babies Snugglepot and Cuddlepie. 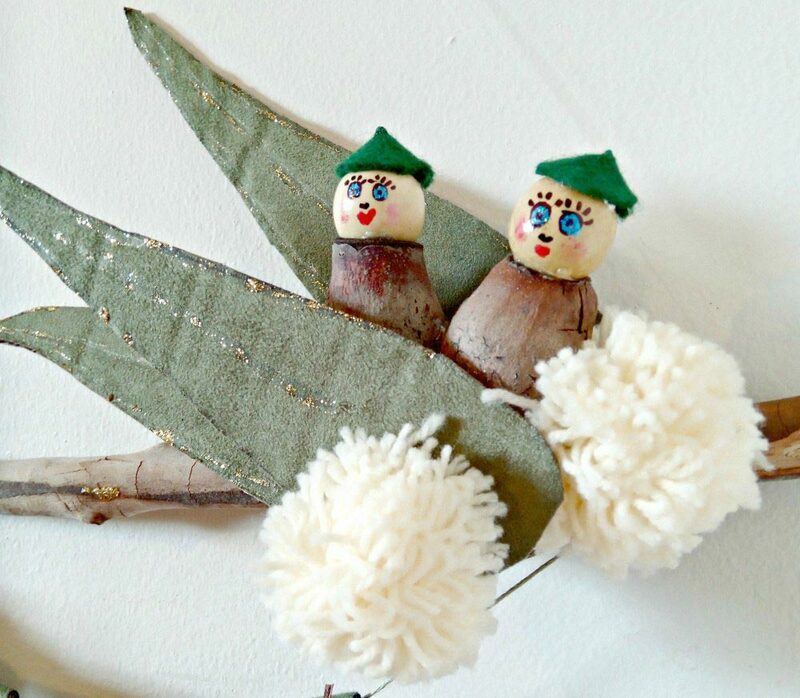 This adorable craft project was created by Bel from Mums Take Five. Start by making two pom pom blossoms with the yellow wool, look it up if required they won’t take long. We used varnished wooden beads so the markers did not run when we drew on faces if you don’t have varnished ones that’s ok just use pencils. You can also add a coat of clear nail polish to them after to hold the colour better. 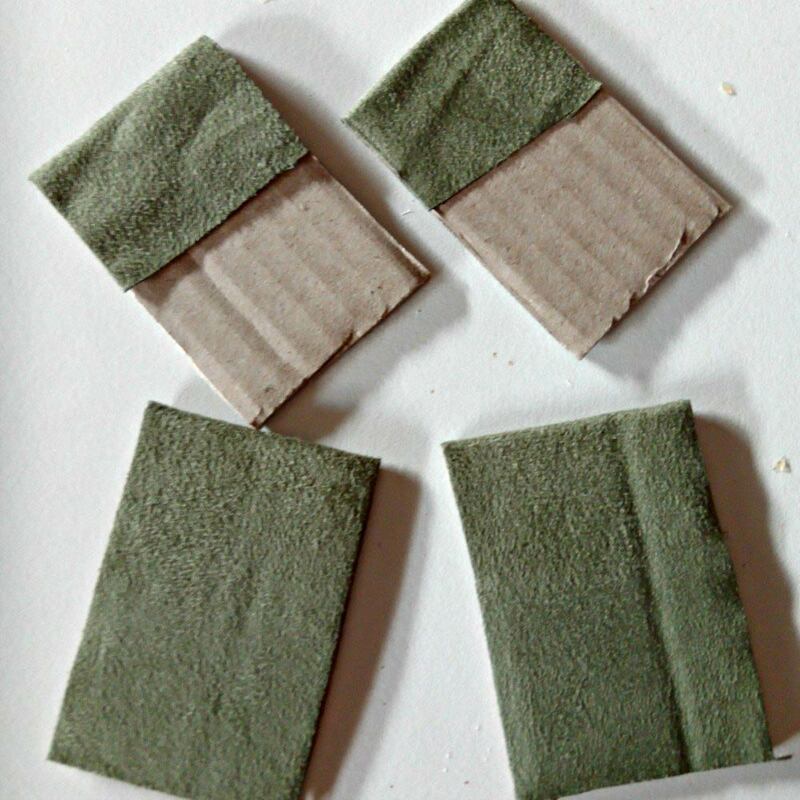 First we made some gum leaves using cardboard and fabric. 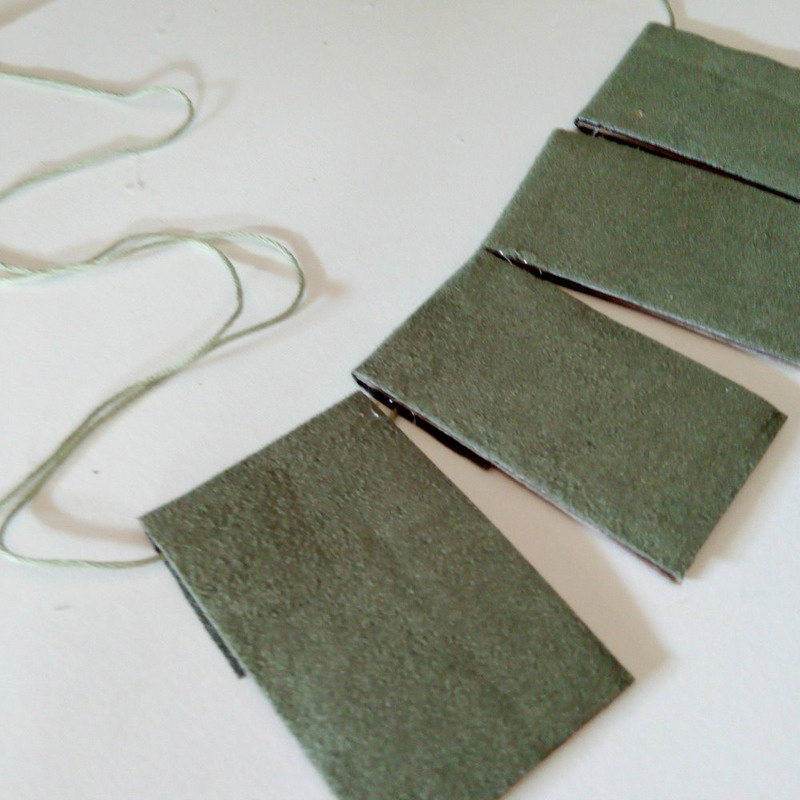 I chose this olive/grey green suede feel fabric because it reminded me of gum leaves and we liked the texture but you chose whatever you like. 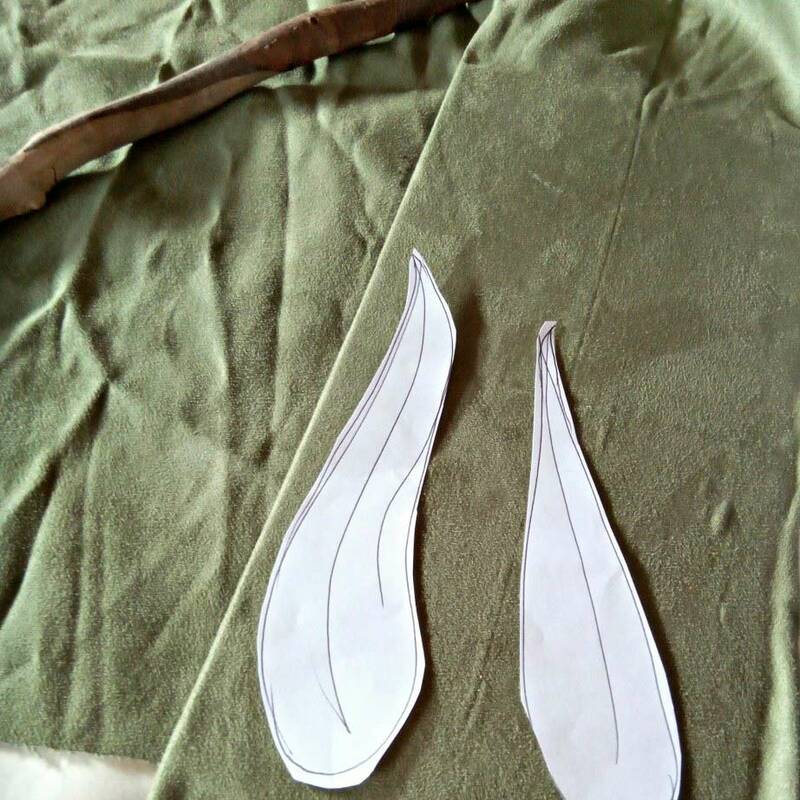 I wrapped and glued the fabric over a piece of cardboard then I drew gum leaf shapes on to paper and cut them out. Just check your leaf sizes with your stick, you’ll want to be keeping everything into reasonable proportion. Once I was happy I lightly traced around them onto the fabric cardboard and cut them out. We made five leaves in total so I had a couple spare in case I need them later. Leave aside to dry. 3.This step is making your Gumnut babies. To start we need a hat, we used green felt that we cut into a circle shape then I cut into the middle once so I could turn into a cone shape. 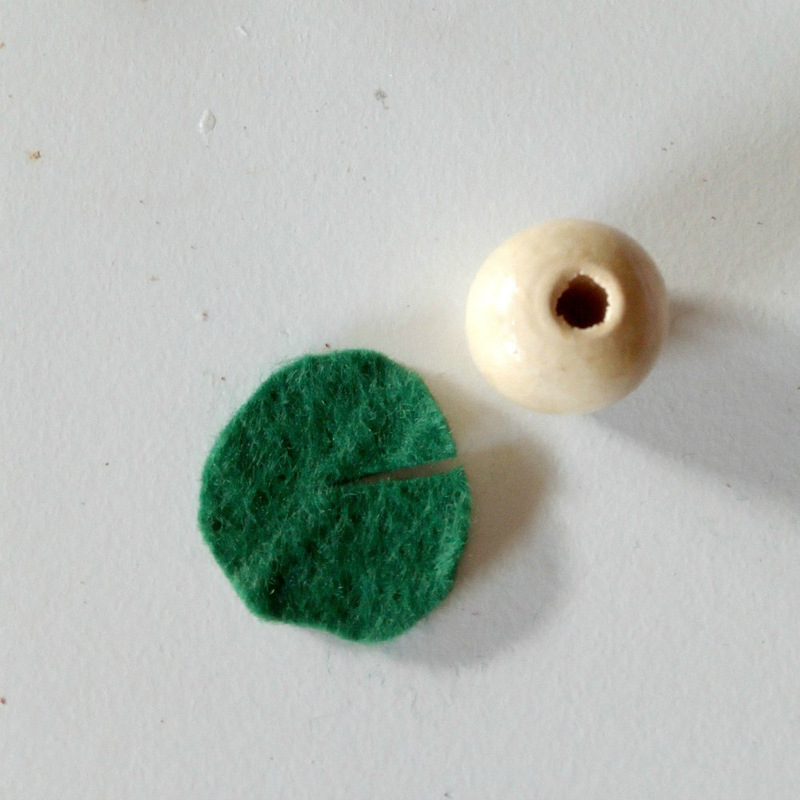 Glue the hat together with the glue gun and then glue gun the hat to the top of your wooden bead. Then I glued the bead into the gumnut. 4.Now we start constructing the pieces. First we made our Snugglepot and Cuddlepie posy. The Gumnut babies have a pair of gumnuts… I didnt, we looked everywhere! So we just hot glued two together to make the pair. 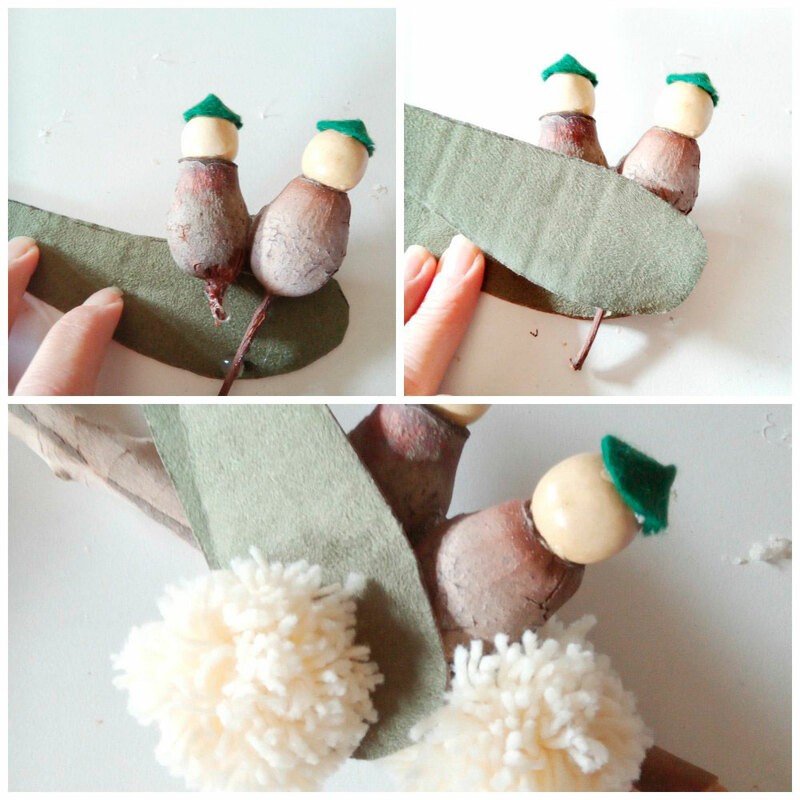 Then we need to secure them amongst our gum leaves so I hot glued a gum leaf the back of the gumnuts and then one on the front. Then I hot glued them all to our stick, be sure to leave space either side to try your strings. Finally to finish the posy I added our little woollen yellow blossom pom poms. Put aside for the moment. 5.To construct the bunting is pretty easy. I used green embroidering thread but you can use string or ribbons whatever you prefer. Cut a length of string that fits your stick. Before you glue test it all fits. Wrap (dont tie on) one end of the string on to the stick a few times then loop it to the other end, place your letter cards on the string to ensure they will fit. You can mark the string with a pencil if you need so you know exactly where to glue them on. Wrap the other end onto the stick then cut the end once you are happy. Unwrap it all off the stick and glue your letter cards on. To do this glue them to the top of the card then fold that extra length over and glue that to the back. 6.Now to add the bunting to the stick by wrapping them to the ends of the stick, once your happy secure with hot glue. Next using your glitter glue write out your letters. 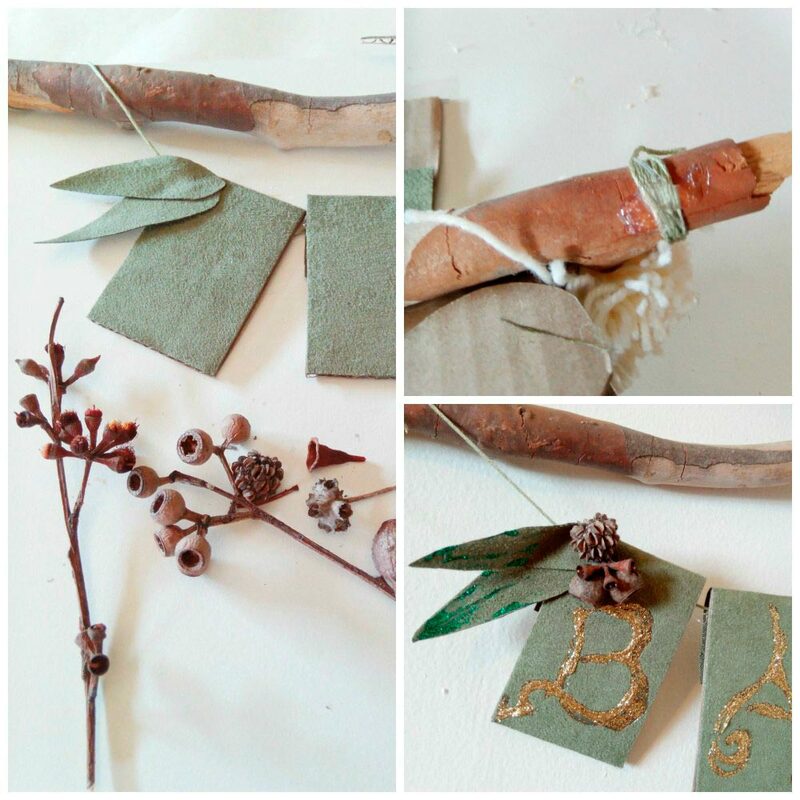 We finished off the letter bunting by adding some small fabric gum leaves cut from scrap and little posies of tiny gumnuts we had. This is also where I used the gold and the green glitter glue to outline the gum leaves and a little on their hats. Leave to dry completely, you don’t want to smudge those letters. 7.You’re almost done! Now this is where we drew on our Gumnut babies faces, we used black sharpie to draw on the eyes, eyelashes and nose. I filled in the eyes with blue glitter glue and then once that had dried added pupils. Draw on red little lips and for their rosy cheek colour I put red sharpie circles on my finger and dabbed it on. 8.Once its all dry tie fishing line to each end and hang! 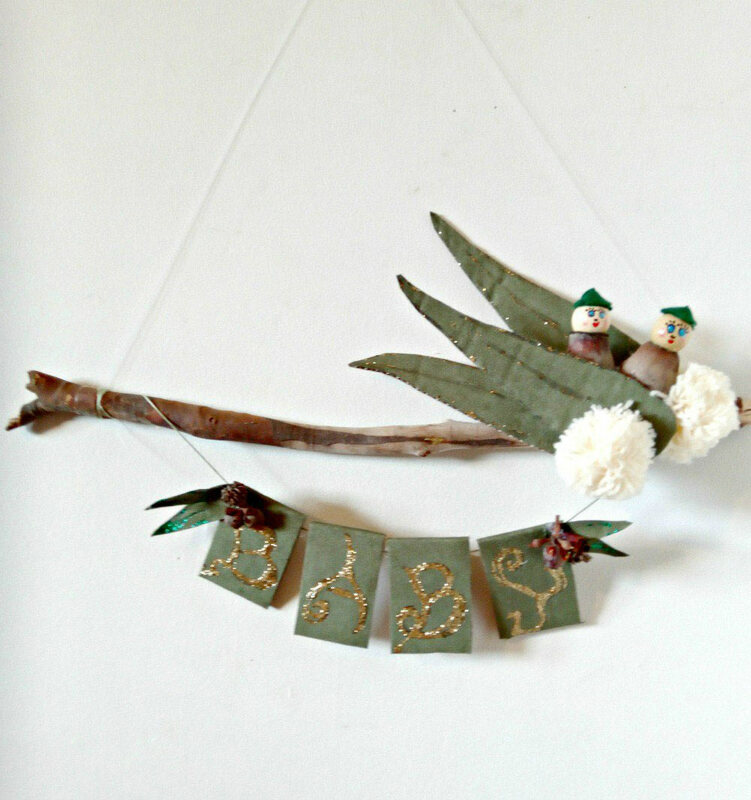 You’ve made your own Snugglepot & Cuddlepie inspired Nursery Wall Hanging.